Its major export partners are the United States, the United Arab Emirates, and Hong Kong. Its main exports are petroleum products, precious stones, and vehicles. Its major import partners are China, Saudi Arabia, and Switzerland. Its major imports include crude oil, precious stones, machinery, and chemicals. Located in Southern Asia, India has a 13,888.00 km border with Bangladesh (4,142 km), Bhutan (659 km), Burma (1,468 km), China (2,659 km), Nepal (1,770 km) and Pakistan (3,190 km). It has a 7,000.00 km coastline. India is involved in territory disputes with China over their rugged, militarized boundary. The capital city of India is New Delhi which is located in the northern part of the country. The major cities of Agra and Jaipur lie to the south of New Delhi. The foundation stone of the city was laid in 1911 by George V, the Emperor of India and initial infrastructure was designed by British architects. New Delhi became the capital city in 1931 after inauguration by the Viceroy and Governor-General of India, Lord Irwin. 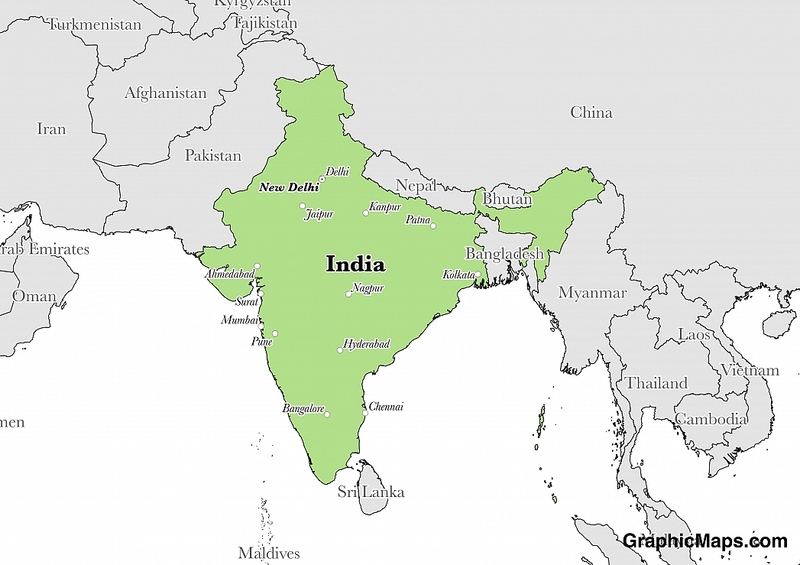 India is an Asian country covering 3,287,263.00 km2 of which 9.55% is water and 2,973,193.00 km2 is land. This makes it the 7th largest country in the world and slightly more than one-third the size of the US. Its geographic coordinates are 20 00 N, 77 00 E and New Delhi is the capital city. The English name for India comes from the Indus River. Its ISO code is IN. India has a mean elevation of 160 m above sea level. It has a varied climate that ranges from tropical monsoon in the south to temperate in the north. Its terrain is diverse with plains in the south, rolling hills along the Ganges, deserts in the west, and mountains in the North. India has a population of 1,266,883,598 making it the 2nd largest in the world. A high population density exists through most of the country. Hindi, Bengali, Telugu, Marthi, Tamil and Urdu are all widely spoken. Major ethnic groups include Indo-Aryan and Dravidian. The most common religious grup is Hindu. India's official government language, according to the constitution of the country, is Hindi in the Devanagari script. This does not mean that Hindi is the official language of the country as no specific dialect has been given this distinction. This dialect is from the Ind-Aryan branch of the Ind-European language family. The Eighth Schedule of the Indian Constitution lists another 22 scheduled languages that are also given recognition and official status. Over the past 50 years, Kannada, Malayalam, Odia, Tamil, Telugu, and Sanskrit have also been added as classical languages with official status. India has the second-most languages spoken in the world after Papua New Guinea with 780. Minority languages and dialects are an integral part of everyday communication in the country as many inhabitants know three or more and can communicate with many different people and ethnicities. Figures vary, but as many as a 122 major languages (spoken by over 10,000 people) and 1599 other languages or dialects are present in India. The most prevalent languages other than Hindi are Bengali, Telugu, Marathi, Tamil, English, Urdu, and Gujarati, to name just a few. The dialing code for the country is 91. India is an independent country. It gained independence from the United Kingdom in 1947. its constitution was last ratified in 1950. The political system of India takes place in a constitutional federal representative democracy. India declared independence from the United Kingdom on 15 August 1947 and this led to the adoption of a new constitution. This document was adopted by the Constituent Assembly in November of 1949 and came into effect on 26 January 1950. The Constitution of India is amendable through the two houses of parliament and the majority of state legislatures and over 100 amendments have been made since 1950. Elections in India take place every five years for the national government and the first of these general elections took place in 1951. Factoring in Purchasing Power Parity, India's GDP is $8,720,000,000,000.00 (USD) with $6,700.00 (USD) per capita. This makes it the 3rd largest economy and its citizens the 153rd richest in the world. The currency of India is the Rupee (INR). Its major export partners are the United States, the United Arab Emirates, and Hong Kong. Its main exports are petroleum products, precious stones, and vehicles. Its major import partners are China, Saudi Arabia, and Switzerland. Its major imports include crude oil, precious stones, machinery, and chemicals. 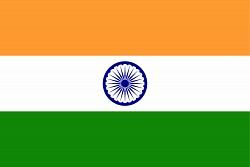 The flag of India consists of three horizontal bands, from top to bottom, of Indian saffron, white, and India green. The Ashoka Chakra is pictured in the centre of the white band in navy blue. This symbol is a 24 spoke wheel that has held cultural importance in the region for centuries. The flag became the official national banner on 15 August 1947 after being approved during a meeting of the Constituent Assembly in July of the same year.